Merkur Gaming leads you straight into a tropical paradise with long sandy beaches, gentle waves and warm summer nights. The Tropical Heat slot machine uses 5 reels, 3 rows, and 10 selectable paylines. The holiday-inspired release is full of exciting features that will bring pretty sunny payrolls to your bank account. On the beach, you will encounter a beautiful woman accompanied by all sorts of cute sea animals and also discover some marvelous wonders of nature. So, if you don’t feel like bad weather and monotonous everyday life, this daring trip could be right up your alley. Mexico, the Bahamas, Philippines, Madagascar, you choose. Tropical Heat is a med/high variance slot with 96.4% RTP. That’s pretty solid although still lower than Merkur’s 77777 slot machine. This wonderful release is perfectly designed to meet the needs of both high-rollers and those seeking just a litte bit of fun and entertainment. Right from the start, you will be immersed in this mesmerizing beach universe and with an incredible Jackpot of $20,000, who on earth wouldn’t be! In Tropical Heat, it’s all about special features and there are several of them included in the exotic adventure. First off, let us mention the pretty woman that stands for the game’s Wild symbol and can substitute for all other symbols on the reels. On top of that, it can unearth a life-changing amount of up to 10,000x your stake if you are fortunate enough, of course. 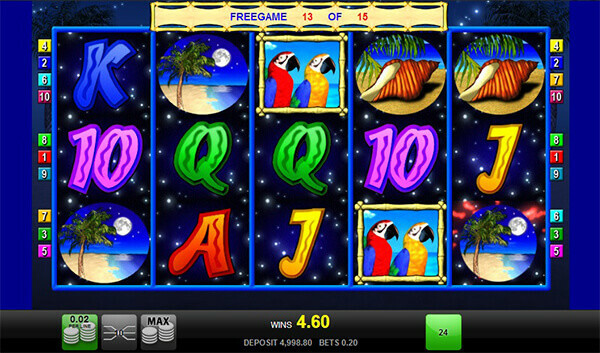 To trigger the Free Spins feature, you need the help of Scatters that are represented as colorful parrots. If you manage to land at least three of them anywhere on the reels, you will be awarded 15 free spins. Moreover, this feature also comes equipped with the 3x Bonus Multiplier. Furthermore, the parrot symbols bring their own lucrative prizes as well, those being even 4,000x your stake! 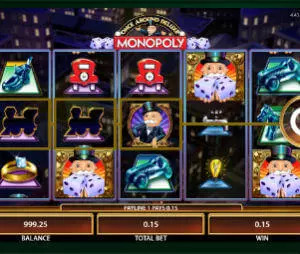 Last but not least, the Free Spins feature can be re-triggered. There are certainly not many downsides to the Tropical Heat slots. One of them could possibly be the fact that the graphics and quite a generic soundtrack are far from being polished and very revolutionary like in some other slot machines. The visuals can appear a bit dated and unauthentic in comparison to some other modern titles. However, with all other valuable aspects taken into consideration, this game makes for a more than a decent and rewarding choice. In spite of the fact that this release doesn’t boast any impressive graphics or astonishing animations either, this great game developer made it sure to make up for that by incorporating some special bonus features that can promise quite rewarding cash prizes helped by plenty of free spins and very decent multipliers. Start rolling and check them all out for yourself.